The Office Showroom - Design, Planning, Delivery, Installation and Support for Architects, Planners, Facility Managers and Engineers. At The Office Showroom, we have the largest selection of desk ranges that will meet every requirement, including taste, budget and function. Many desks have cable management, modesty panels, real wood veneer, and matching storage options. The Diamond system is a flexible bench system which can also be specified as an independently free standing table range. Diamond offers unlimited configuration possibilities and allows complete flexibility to reconfigure. Tables are connected by a series of steel beams. Cable management is available in the form of cable tower legs and under desk cable trays. Melamine top finishes: White, Dark Oak, Light Oak, Grey and Teak. Glass top finishes: Satin, White, Black and Red. Leg finishes: White, Black, Aluminium and Chrome. Linnea provides flexible space for multiple users working individually or as a team. The frame structure is strong, easy to assemble and reconfigure. Linnea has been engineered to allow the sharing of leg components to maximise the use of workspace and minimise the financial implications. Multi-functional dividing screens can also be included and are available in several complemetary styles. Available in Ash, Beech, Cherry, Oak, Walnut and White. At The Office Showroom, we have an extensive range of seating, including task chairs, operator chairs, reception seating, executive chairs, Meeting and Conference Chairs, Break-out Seating and Bistro / Cafe Seating. Many fabrics and leathers are available in many colour choices. 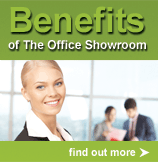 At The Office Showroom, we have many storage and filing ranges available. Often the desk ranges have matching storage options to keep you looking the same, or choose any of our practical storage ranges to solve your space issues. These filing cabinets are built to last and feature a fully welded construction and double skin drawer fronts. The range includes four, three and two drawer versions for foolscap and A4 filing. Backs and sides are pierced to enable units to be bolted together. Smooth action, heavy duty roller ball bearing slides with 100% extension. Filing Cabinets can be fitted with compressor plates. Fully welded carcase without bolts or rivets for greater strength and cleaner lines. Model numbers: BS4E, BS3E, BS2E. All variations of BaseLine are module-orientated with many possible combinations and smart detail solutions. The range includes durable Beech and Birch laminated cabinets for sorting and storing post, forms and periodicals. The straight forward, ingenious cabinets can be used together and therefore fit almost anywhere. The Expo range is a timeless, practical and functional range of office cabinets for post, forms and brochures/periodicals. These cabinets in White, Oak or Grey laminate have flat-topped side panels and are only made to order. Choose between polished or chrome handles. These new flexible office units are based upon the popular Expo cabinet for brochures and periodicals, but with a special stair-shaped form. Etage is available in two models which are mirror images of each other. The 'steps' are not just decorative, they are also practical and ideal for decoration. Etage is also perfect for meeting areas , just the right place to lean over and chat. First impressions do count and when choosing a reception counter it is important that it reflects your company's style and interior. Our reception desk ranges come in a variety of veneers and laminates, finished with highlights of contemporary chrome and glass. Luna is a system that makes use of its rhythm and modularity to furnish spaces both large and small. Available with methacrylate fronts with aluminium counter tops or wood MFC fronts with etched glass counter tops. Matching storage and a DDA compliant module complete the versatile range. The crisp, sharp contemporary aesthetics of Evolution Elite create a highly impressive piece of furniture with the ability to truly dominate a space. With careful specification, it can also blend harmoniously with any existing environment. Brushed finish steelwork, integral LED lighting and sand blasted toughened glass, combine perfectly to produce the ultimate reception desk. Image is an innovative reception desk range, that combines function with design. It offers a variety of curved and straight modules that are enhanced by the use of natural Oak and Wenge veneers. Glass or marble counter tops are supported by 60mm thick panels. A cable management system is supplied with every reception desk as standard. Simple, flexible and affordable with clean minimal design, Evolution Classic is available in many single and two person models, including options with integrated returns. Evolution Classic 'Compact' is designed for projects where budget is as tight as the space available. It provides all the benefits of the Classic range but within a smaller footprint. Evolution Classic 'Access' recognises the needs of wheelchair users by offering the options of recessed areas in front of and behind the desk. Our innovative meeting and conference room furniture offers a wealth of new ideas and solutions, maximising seating space with comfortable traditional or modern designs and finishes. 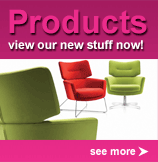 Please click on the boxes below to view our extensive ranges. The Office Showroom brings you a beautiful collection of glass boardroom and glass conference tables. Available in many different configurations with many different glass finishes and colours. The General range of tables are all available in a number of MDF finishes and with a huge choice of base style from traditional to modern.